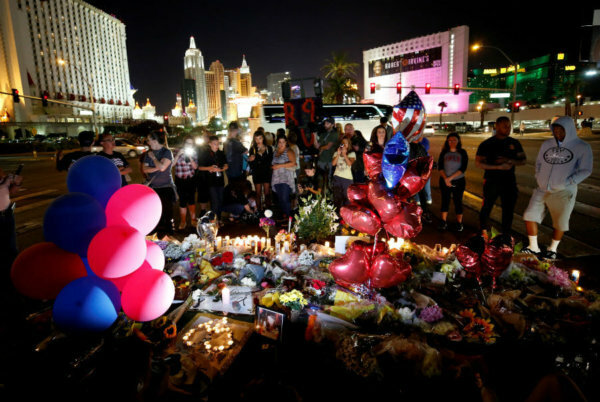 WASHINGTON —Immediate makeshift memorials in Las Vegas to the 58 victims killed during the Oct. 1 outdoor country music concert are being replaced by memorial services, vigils and Catholic funerals at the victims’ hometowns across the country and in Canada. Many of the services are taking place in California since 33 of the victims, more than half of those killed at the Route 91 Harvest Festival, were from the Golden State. 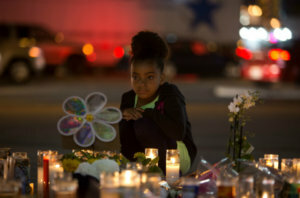 Bakersfield, California, two hours north of Los Angeles, was home to three victims of the shooting. A memorial service was held there Oct. 6 at St. Elizabeth Ann Seton Catholic Church for Jack Beaton, a 54-year-old father of two who worked with a roofing company. More than 800 people attended the service where Beaton was remembered as a fun-loving friend, a hard worker, a kindhearted neighbor and a devoted husband and father of an 18-year-old daughter and 20-year-old son. He and his wife, Laurie, attended the concert to celebrate their 23rd wedding anniversary. He died in her arms after putting his body on top of hers to protect her. In San Francisco, a funeral Mass was celebrated Oct. 12 at St. Mary’s Cathedral for Stacee Etcheber, a 50-year-old hairstylist and mother of two children, 10 and 12, who was attending the Las Vegas concert with her husband, Vince, a San Francisco police officer. At the funeral Mass, so close to where the devastating wildfires are happening, the San Francisco Chronicle said it was not lost at anyone that Etcheber was exactly the kind of person the area needed at this time. She was described as someone who wouldn’t have thought twice about volunteering and doing what she could for the thousands affected by the fires. She also would have been the “the incident commander” getting horses to safety, Father Michael Quinn, pastor of St. Mary Star of the Sea in Sausalito, California, told the congregation. 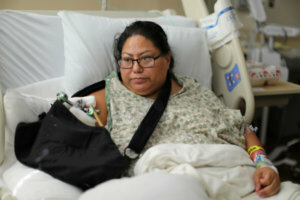 The Etchebers had been separated during the chaos of the shooting. Her husband, who survived, was helping many of the wounded at the concert. Although Stacee was not a member of the San Francisco Police Department, her funeral included many of the honors of an officer’s funeral. Bagpipers played as officers with the department’s mounted unit stood their horses at attention outside the cathedral. Some of those in attendance wore orange ribbons for Stacee’s favorite color. The same day, a funeral Mass was celebrated for 28-year-old Christopher Roybal, a 10-year veteran of the U.S. Navy at St. Matthew’s Church in Corona, California. Roybal had gone to the concert with his mother, and like many others, they were separated in the confusion during and after the shooting took place. “He always made me feel so beautiful, so amazing, and I’m sure that a lot of you in here understand exactly what I’m saying because he was such an amazing soul,” his mother said at the funeral, according to the local ABC news affiliate KABC, which also reported that the priest encouraged the congregation to sing Roybal a country song as a final goodbye. Roybal’s father said his son’s Navy training immediately kicked in when the gunfire started. He suspected that his son “immediately went into that mode of protecting everybody around him like he did in Afghanistan — the sound nobody will understand — Christopher just started saving lives and not for one second thought about his own life,” he said. In Alberta, Canada, a candlelight vigil took place just two days after the Las Vegas shooting at St. Rita’s Catholic Church in Valleyview for Jessica Klymchuk, a 34-year-old mother of four and educational assistant at St. Stephen’s Catholic School, across the street from the church. “I just really, really miss her,” said a 10-year-old at the vigil. An 11-year-old described her as the kindest person he knew, reported CBC News in Canada. Klymchuk, one of four Canadians killed in the mass shooting, attended the festival with her fiance. She wore several hats at the school where she was a bus driver, a classroom aide and librarian. A celebration of life for Sandy Casey, a newly engaged 35-year-old resident of Redondo Beach, California, was scheduled to take place Oct. 17 at the United Church of Dorset and East Rupert in Dorset, Vermont, where her family lives. Casey, who was a special education teacher at Manhattan Beach Middle School near Los Angeles, attended the College of St. Joseph in Rutland, Vermont, and received a master’s degree in special education in 2005 from Assumption College in Worcester, Massachusetts.